It has finally happened. Both the Tree Swallows and the Bluebirds have started to build their nests. They are pretty late this year, but it has happened. Every single year it is like watching the Hatfields and the McCoys. We have two bird houses spaced about twenty three feet apart. The Bluebirds usually come first but this year the Tree Swallows were the first to arrive. They just hang around for a while, look in both houses and then start building. They always choose the same house even though I am sure these aren't the same birds returning year after year. During the process, the bluebirds sit in a nearby tree but as soon as they show any interest in going into their house, they are bombarded by the swallows. They even physically fight with feathers flying. Soon one or the other completes their nest, lays the eggs and begins incubating. At that point the other finishes and from then on everything is fine. They live in harmony. The Tree Swallow sitting on the bluebird house. 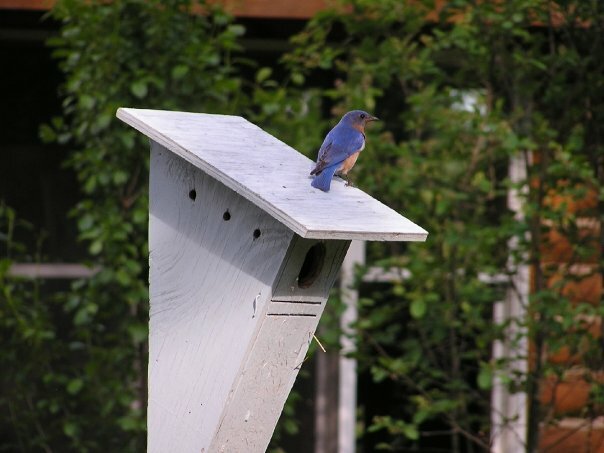 The Bluebird sitting on the Tree Swallow house.